The Smyrna Police Department’s newest officer got a rousing reception from students at Belmont Hills Elementary School May 2. K-9 Officer Max is a chocolate Labrador that will be sniffing out drugs and searching for missing persons. The Smyrna Police Department purchased Max after retiring K-9 Officer Paco. K-9 Officer Max and they will be assigned to the Special Operation Division of the Smyrna Police Department. K-9 Officer Max is trained in illegal narcotics detection and scent detection for people and articles. K-9 Max will also play a vital part as a community relations tool because of the Labradors fun loving temperament. 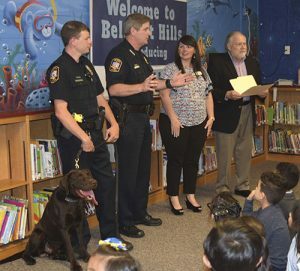 The students at Belmont Hills Elementary held a name contest last fall when the Smyrna Police Department first purchased its new canine and the students came up with the name “Max.” “Max” was the first choice of four classes and second choice in three. 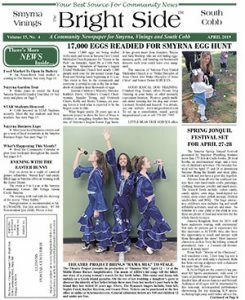 Police Chief David Lee said his first call after hearing the name choice was to Smyrna Mayor Max Bacon to see if approved of the name. “I love it,” said the mayor. For all of their enthusiastic support and help, the Smyrna Police Department treated all of the classes that helped in naming Max to a pizza party as well as the opportunity to interact with Smyrna Police officers. K9 Max has been in training for several months in Gainesville, Ga. and he and his handler Officer Seller still have another week of training before being on the job. K9 Max was born in October 2016. “He still has a little puppy in him,” Seller said.